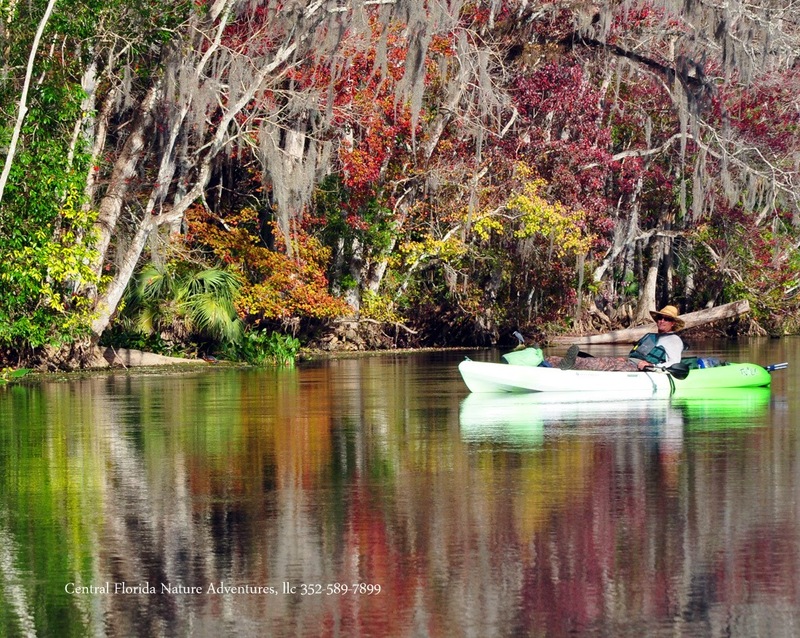 Being close to Orlando makes this a great place to kayak. Choose your tour and experience turtles sunning on the logs, birds serenading as we paddle along, the beautiful wildflowers that bring color to the river. 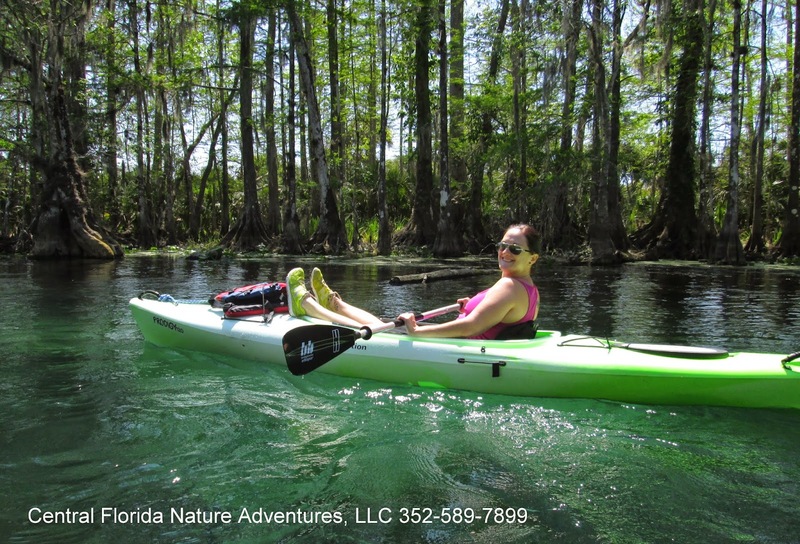 With Central Florida Nature Adventures, llc guided kayak tours, you'll discover Florida's wildlife and have an amazing time on the river! Call us at 352-589-7899 or click here to email us. Three springs pour into this pristine river. 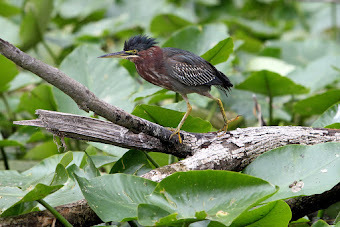 The Great Egret, American Bittern, Woodpeckers, Great Blue Heron, as well as many other Herons and waterfowl flourish on this river. The Ivory-billed Woodpecker at one time called this home. These shallow waters create a fantastic environment for many different species of plants, fish and other wildlife. Less than an hour from Kissimmee we are able to do a 2-3 hour or a 4-5 hour tour here. This historic river was once the highway for commerce in Central Florida bringing goods to the area by paddle wheel boat. It is now a paradise for wildlife. As one of the few rivers that flows North, several springs and tributaries join in to create estuaries for fish of all kinds. 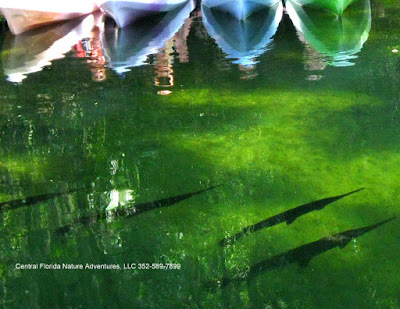 As you paddle over the clear waters of Blue Springs, it's like kayaking in an aquarium. The Bald Eagles, Osprey, Herons, Wood Storks, Limpkins, Anhingas, Egrets, Cormorants, Alligators, Turtles, Garfish, Bass and many more species thrive here and call this place home. Just north of Orlando, it's a relaxing 2-3 or 4-5 hour tour. As you may already know Winter in Florida is a magical time. The Manatee comes inland to bask in the 72 degree waters of Florida's beautiful springs. If you have never experienced this gentle creature, now is the time! Located between Orlando and Daytona Beach this is an incredible 2-3 or 4-5 hour tour. 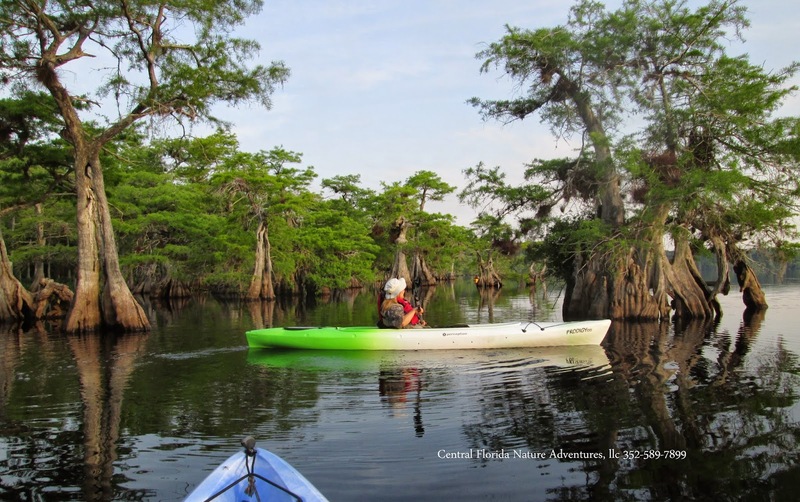 Paddle through an enchanted blackwater forest to a beautiful lake rimmed with Cypress trees that are hundreds maybe even thousands of years old. These weathered trees tell many stories about the history of this land. Right outside Mt Dora, this is a 2-3 hour treat. This river meanders through enchanted forests as well as wide open savannas. The water is crystal clear and home to many types of fish and wading birds. You'll also have a chance to see raccoon, bobcat, turtles etc. There are many places to stop and relax or if you choose to, go for a swim. Being close to Orlando also makes this a favorite 2-3 hour tour. This run takes you on some of Central Florida's fastest water. Paddle upstream to the top and let the river shoot you through the gap back to the bottom. This narrow river screams excitement and fun to the experienced paddler. Between Daytona and Orlando this is an awesome 2-3 or 4-5 hour tour. Exceptionally scenic! Some twists and turns of this river can reach depths of more than 30 ft and it’s so clear you can see the bottom. 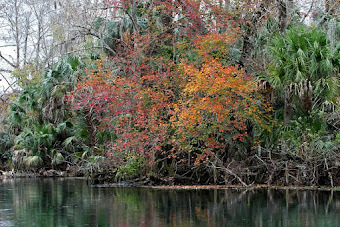 Silver Springs which creates the Silver River is the second largest spring in Florida. You will definitely hone your paddling skills going upstream but the magnitude of this spring makes the trip back a breeze! 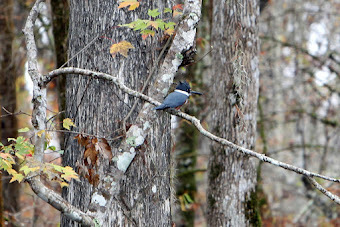 You’ll have a chance to see lots of wildlife; otters, wading birds, hawks, owls, raccoons, wild pigs and more. See giant garfish, armored catfish, bowfin and maybe even a monkey or 12. 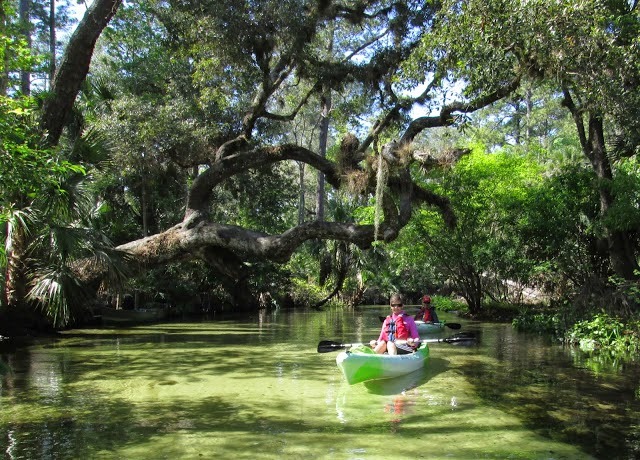 Just outside of Ocala, this is a beautiful 4-5 hour tour. We have packages for ages 5 and above and all of our tours are booked by reservation. With no more rentals of any kind, Katie's Landing offers a beautiful area to launch your own canoe or kayak and space to have a picnic by the river. Katie's Landing has been purchased by the State of Florida and is now a beautiful natural park with no more rentals of any kind. As of the year 2010 there are no cabins, no boats, no canoes nothing to rent at all and no swimming is allowed. 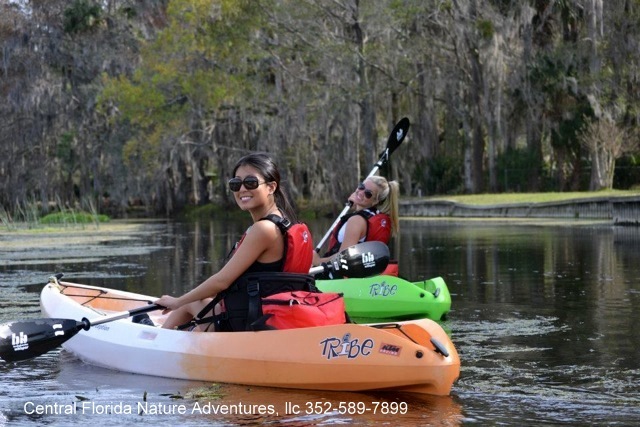 Since Katie's Wekiva River Landing is still in several Atlases, Paddling Trail Books, Magazines and online in several places with misinformation, we wanted to help clear this up.